Smoke coming from the hood? No air conditioning – and it’s sweltering! Time for an overheating or air conditioning check. 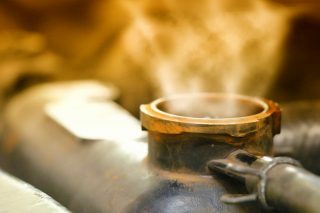 One of the most universally recognized signs that a car needs to visit an auto repair shop is smoke or steam coming from under the hood. Most people have felt the dread that accompanies driving down the road when all of a sudden, steam bursts up through the sides of the hood. This means that for some reason, your car is overheating. There are also other signs that could point towards this problem. Most cars have certain gauges or warning lights that can help diagnose overheating. The temperature gauge, for instance, can warn of overheating when it shows a high reading. Some cars even have overheating warning lights which can signify that it’s time to get auto repair service in Las Vegas. If you have had an overheating problem with your vehicle before, you know that your car’s coolant reservoir can deplete rather quickly. This and a sweet smell coming from the car are obvious signs that something serious is going on. Overheating will also cause your AC system to not work properly. Your car could be overheating due to a loose hose, a serious radiator problem and everything else in between. 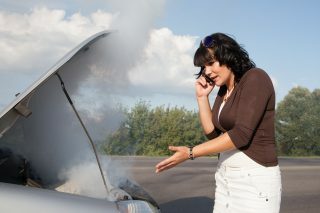 Give us a call at Leavitt’s Auto Care so that we can fix this issue for you. The Better Business Bureau has trusted us for nearly ten years, so you can too.